I was out on the rocks by the sea at Rooiels this afternoon taking some photos when I saw the strangest thing. 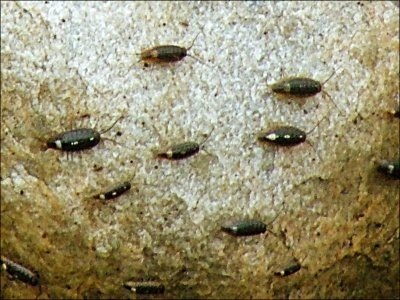 I spotted a cockroach on a rock near my feet and when I looked at the rocks a little further away, they were crawling with hundreds, if not thousands of small cockroaches. The strange thing is that most of them were moving in the same direction, forming a column that swarmed over the rocks with a definite sense of purpose. I have never seen anything like this before. I wonder what they were doing? Migrating perhaps or heading towards a food source? I didn’t smell anything that would indicate a dead creature nearby but there was a fair amount of decomposing kelp between the rocks there. This is what they looked like. This entry was posted in Photos, Thoughts and tagged cockroach, rocks, sea. Bookmark the permalink.